That was pretty much that. I spent most of my time on most of my days in the garden, usually hoeing, weeding, or mulching in some vegetable bed or another. The folks who I worked alongside (both residents and interns) knew a lot about plants and agriculture. I enjoyed hearing about different ways to control weeds and pests while persuading the crop to grow. Their knowledge was both wikipedian and experiential. I learned that many plants are thinned or culled to promote new growth or larger fruit. We spent a while thinning the peach and apple trees, ultimately causing the trees to yield fewer, but larger fruits. Sometimes the ratio of thinning to keeping was as high as 8:1! We experimented incorporating the under-ripe fruit into pickles and sauces with mixed success. Garlic can also be treated to promote larger bulb growth. 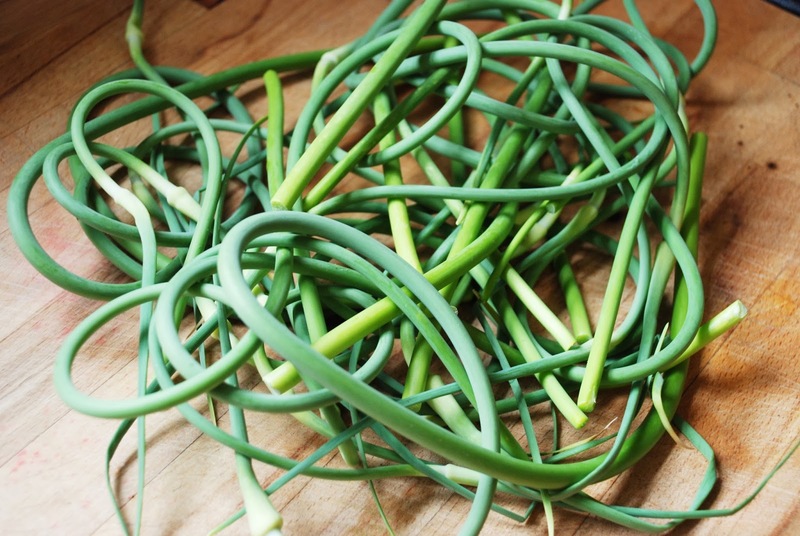 When the garlic wants to flower, the shoots (called scapes) can be removed so that the plant will not flower, and will instead put more energy into making a bigger bulb. 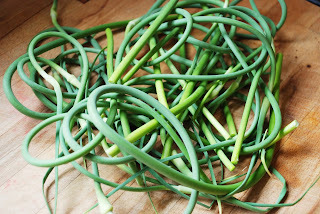 We began cooking with garlic scapes a month or so before the first garlic of the season. Scapes are quite potent and spicy when raw, but mellow out once cooked. I chopped them like green beans. Young squash in the foreground and garlic in the background. The beds are mulched with straw and the paths are mulched with pommies. Other kinds of garden work were: harvesting, bed preparation (hoeing, turning, and sowing seed), staking (for climbing beans or tomatoes), squashing squash bugs/eggs (an unending uphill battle), hilling potatoes, digging potatoes, turning compost piles, and sometimes scything. Occasionally I'd get to spend some time in the blacksmith shop. Sandhill farm started coming together in the mid seventies, and a guy who was into blacksmithing lived there in the 80s. He'd moved on, but the forge and anvil were still there and good to use. hook knife and short sloyd. mostly for spoon carving. These blades were hand forged, filed, and heat treated. I wanted to see how much work it would be to make one without power tools. I like hand filing. A coarse file can do a lot of work very fast. It's possible to hold a conversation or simply listen while filing, but not while belt sanding. This is a small adze that Darien and I made from a rusty ball peen hammer head. I spent many evenings in the woodshop working on making instruments or tools. There were a bunch of great tools there, mostly home repair/construction stuff but a few nice chisels, gouges, auger bits, drawknives and spokeshaves. To my surprise, there was no shavehorse to go with the drawknives, so I made one. as quickly as I could. The legs and pin are silver maple. The rest is cottonwood, with the exception of the lever arms which are oak. The real pins are 1/2" steel rod. I did the angled holes by eye with an angle gauge and a brace and bit. The compound angles for the back legs were mostly eyeballed. I used an adjustable auger bit to get the full 2" hole diameter necessary for the legs to fit in. The legs are not permanently fixed. That way, the shavehorse can be stowed in a corner when not in use. The woodshop also had the added bonus of staying cool through the summer heat. It was located on the ground floor of an earth-bermed building. I had a good time talking about and figuring out old tools with another intern, Darien. We share an interest in old woodworking tools. He's much more precise and forward thinking than I am. He also knows how to throw pottery on a wheel. There was no wheel at Sandhill, but there was good clay about. In fact, most of the surrounding land is clay. The old town of Sandhill, MO (the farm now sits on top of it) was called such because of its sandy soil and high relative elevation. I slapped together a wheel with bicycle parts. I used a rear wheel, constrained on only one side to a steel plate with a 3/8" hole in it. I harvested the cranks and bottom bracket from a dead bike to drive the wheel. I saved the derailleur to use as a chain tensioner, and managed to have a few different speeds to work with. My design was exceptionally goofy and unfit because I'd never thrown before. The wheel was twice as large as it needed to be, could have been heavier, and should have been geared lower. It was also very wobbly. When you make one, stiffen it by using a thicker steel base plate (mine was a rusty 1/8"). In spite of the wheel's poor design, he managed to get couple of bowls and a cup out of it. Together, we hit up Dog and Gun, the local (monthly) flea market. It was an excellent place to find old woodworking tools as well as various other oddities for a few dollars. My acquisitions included a side axe, a block plane, some sharpening stones, a few files, a cast iron skillet, a hand cranked grinding wheel, a gun case (which I gave away), and a large bag to put all of my newly acquired junk in. There were lots of tidbits of old technology from before and during rural electrification, as well as your usual harbor freight-like flood of new stuff. It's the asymmetry that makes it a side axe. Being flat on one side makes it better at roughly planing a surface. It's easier to make things smoother faster. I originally made it a nice black walnut handle, about 1.5x the length of the one pictured. I snapped it at the end of the summer, not under any great strain, but because black walnut is a brittle wood. I made a red oak handle at home. I only ever use it in short strokes for roughing spoon blanks so I made the handle short. I shaped it with a drawknife and a rasp. Now, a few months later, the eye of the handle has shrunk, leaving the head a bit wobbly. Perhaps the wood I took from our firewood pile was not dry enough. By the end of the summer, I'd made a few instruments, accumulated a small pile of tools, and learned a few new shop tricks. The neck is honey locust and the fretboard is osage orange. Those are two of the most rot resistant woods in North America, and as a result, they're commonly stuck in the ground as fenceposts. The banjo is fretless and uses fishing line strings. The pseudo-round is a pair of stacked and offset nonagons, forming something similar to an 18-gon when viewed from above. I cut the precisely angled segments of oak on a table saw after some trial and error with the angles. They were fixed together during gluing by a strip of bicycle inner tube, wrapped around the outside with ever increasing tension. The tuning pegs were made with peg shaver and reamer, not unlike Tim Anderson's. A good chunk of my time in the shop was spent working on a fiddle, on which I posted an instructable. Mealtimes were probably one of my favorite times. We were on a cooking rotation with one person cooking dinner each day and leaving enough leftovers for lunch the next day. Everyone at Sandhill shared an immense appreciation for the local, homegrown food. I grew to love pickles and relishes for their ability to enliven almost any dish. Field crops (i.e. cultivated by tractor) included wheat (hard & soft), oats, a few types of corn, black, pinto, & soy beans, and of course, sorghum. The start of the wheat harvest. The combine harvester here is from the 1940s. Its collection of belts, pulleys, and cams is doctor seussical. Even better, it's built to be worked on. The manual lists all of the fan, agitator, belt, and height settings for harvesting different seeds. Bearings shot? no problem. The whole machine uses only three standard bearing sizes. That is unimaginable in this machine's modern equivalent. I did a bit of tractor work, mostly the unskilled job of mowing. However, mowing on a tractor was new to me. The tractor was a 1940s? Massey Ferguson named Desi. The mower swung enormous 3 foot long blades leaving a 7-8 foot wide cut. The blades were 5/8" thick and "sharpened" to a ~50 degree double bevel. I put sharpened in quotes because the blades were deemed sharp when they had a 1/4" radius on the cutting edge. It was towed behind the tractor, and took power through the tractor PTO, through a couple of universal joints, and into a gearbox containing a pair of bevel gears. Raising and lowering the mower was done with a hydraulic jack, connected to the tractor's hydraulics. With the tractor in second gear, the mower could take down a row of 2-3" thick saplings. I made sure to hit it up all of the bearings with the grease gun every session as was recommended. Another tractor job I got to do was chisel plowing. When a field is repeatedly worked (driven over) by a tractor, it gets compacted some. A chisel plow digs deep (6-12") and breaks up the compacted layer (hard pan) that something like the disk can't reach. The chisel plow (with seven tines) also takes an enormous amount of force to drag through the earth. This was done with the biggest tractor named Cathy. Cathy is a large 1970s Allis Chalmers tractor with a hydraulic bucket on the front and tires with calcium chloride in them for ballast. She grunts and hems and haws when you lower the chisel plow into the earth, even in second gear, but then just keeps on going. It would have taken one hundred of me many weeks to do the work that Cathy did in five hours. She consumes about three gallons of gasoline per hour, perhaps more while chisel plowing. All in all there were no more than ten people living at Sandhill while I was there. They ranged in age from 5 to 65. All were very knowledgeable folks with interesting stories and pursuits. On the whole, there was a lot of work! I'd say it was comparable to a 9-5 job with all of the chores and daily routines factored in. There are some nearby communities: the ever growing Dancing Rabbit Ecovillage (abbreviated as DR) and its neighbor, Red Earth Farms, where folks are more interested in alternative energy and natural building. Both communities consist of steads, where people buy or rent a piece of land that is owned by a collective of people. Each has their own sets of rules for things like new construction, land use, and conflict resolution. Together with Sandhill, these three are known as the tri-communities. There was also the Possibility Alliance, a small community a bit further away that uses no electricity and attempts to avoid things that were produced with, or consume fossil fuel. They don't even use the internet! Outside of our bubble, there were endless fields of corn and soy with roadside signs displaying the name of the seed company from which the farmer purchased their seed. 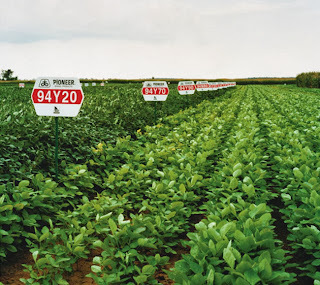 The signs bore names like MorSoy Xtra 48X00, Pioneer Products (DuPont), Burrus PowerPLUS 4Y27AMX (TM). I found it humorous that the Bayer company produces an herbicide called Liberty, and to go with it, a set of GMO traits called Liberty Link. Coming back to school sure was a change of scenes. I was hoping to gain some clarity, perspective, or perhaps just more of an appreciation for school and the resources there. Maybe I have. I never ended up feeling any overwhelming pull towards or away from school as I had expected to. Instead, school started, and now the semester's almost done. Quickest one yet. With finals season approaching, I managed to end up with 3 technical classes, one music class, and no final exams. Absurd! Am I not working hard enough at school? I've always had at least two finals in the past. This time, I booked a bus ticket home early. Looking forward to getting some tinkering in.